Isnt this all just amazing? I am going to start writing down my favorite quotes on sticky paper and attaching them to my bathroom mirror so I can see them daily. Today I am going to soak up life a little more and give my favorite little person in the whole wide world my full undivided attention. I am having a small case of Mom guilt...so today is all about little trucks and blocks and a trip to the duck pond. Hope you all have a wonderful Friday! Oh and want to know what I hate more than anything?! ANTS. Why are they in my dryer!!?! Umm hello there is no food in there weirdos. They are SO ruude and apparently immune to Windex. These quotes are beautiful! Thanks for sharing! How fun! I put quotes on my fridge...pretty boring but having a family it seems like I spend quite a bit of time in the kitchen!! Wonderful set of quotations... very inspirational! Did you know I collect ones for jewelry fans? great idea! a little inspiration in the morning is just what everyone needs! I like it! I'm a little addicted to sticky notes, which is not very "green" of me. I use them for my daily to-do lists. I think the quotations would be a little more inspiring, though! 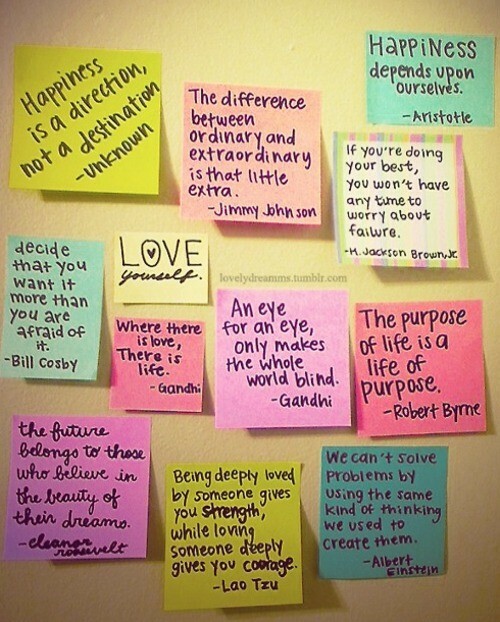 thanks for the quotes lindsay, definitely great reminders to have when you need a little pick me up in your day! hope you have a great friday! I love the sticky notes idea! I have a big section at the front of my Moleskin journal dedicated to quotes that inspire me, but I might have to do this too. One of my favorite gifts that I ever gave a few of my girlfriends was a quote journal. I bought each a pretty journal and filled a few pages with my favorite quotes. All have told me that they have continued to jot down other quotes that they come across. PS: We have ants in our dishwasher! Aww have fun with your little boy!!! You're such a great mom. And how weird! They must be very confused ants! I love these quotes - especially the Eleanor Roosevelt one. That is probably my all time favorite! Have a wonderful weekend girlie!!! Ants are the worst! They are so sneaky and intrusive. Grr. You should see where my sister lives Lindsay. She's got sticky notes and other mantras plasted all over every single wall in the house. Some of them are funny because she never takes any notice of them! LOL Enjoy time with little Maxy. They love the duck pond, don't they? And I hate ants too. Have a great weekend! These little quotes make me happy, thanks for sharing! Hope those ants leave soon. We have earwigs here, so gross! I love this! So many of my friends have done this with post its and it's so cute! Great inspiration! I saw the BEST quote today. "Do not spoil what you have by desiring what you have not: but remember that what you now have was once among the things you only hoped for." Amazing right? I had never thought of it that way. I love it. I really love the Gandhi quote. They are all very inspiring. I like Gandhi's an eye for an eye. I'd also like to add Proust's "The real voyage of discovery consists not in seeking new horizons, but having new eyes." i love all of those and the one above from nonoy! These quotes are words to live by!! Awesome. Great Quotes! thanks for sharing! Try some Raid on the ants! I love the quotes and also your blog. i've always loved that photo - such a great source of encouragement and inspiration. thanks for the reminder! i need to start doing that as well. Ants is the dryer?! That IS bizarre. May I add to your quote collection? "There is one thing one has to have: Either a soul that is cheerful by nature, or a soul made cheerful by work, love, art and knowledge." What a good idea! I've saved a few quotes at my desk but they're currently in a drawer for some odd reason and not up INSPIRING me daily. Love the sticky notes. Ants invade our mudroom every spring and it drives me insane! I hope they leave your house soon. Love all those quotes! What a great mid-week reminder.